The traditional view is that language is only important in language lessons. Today however, language is no longer seen as a goal in itself, but also as a tool through which students interact with friends and peers in schools, and through which they learn content matters in subjects like science, geography, history and mathematics. students at the age of 12/13 are required to have a minimum level of language competence mirroring B1 in all skills in order to succeed in history/mathematics. 15/16-year-old students need a B2 competence in the same skills/subjects. Self-assessment helps learners take ownership of their learning. Language descriptors can be used to encourage students to set goals and make them aware of what they need to be able to do in the history/civics or mathematics classroom. The teacher and the students can discuss which skills it makes sense to focus on, and the teacher can provide them with relevant language descriptors related to the CEFR levels. 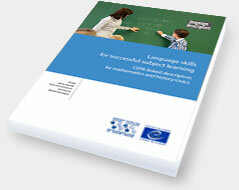 The project Developing language awareness in subject classes is carried out as a follow-up to this publication in the ECML’s programme 2016-2019. SURVEY What do you think about these resources? Video presenting the publication on the occasion of the ECML conference in December 2016. The presentation took place in the context of a workshop involving two related ECML project results/publications (Pluriliteracies and PlurCur). This publication will clearly help reinforce our understanding of language education across all subjects. These pages result from a project run within the ECML's Learning through languages programme entitled "Language descriptors for migrant and minority learners' success in compulsory education" (Language Descriptors).